Three 8-week seasons runs from Oct - Dec (Fall) Jan - Feb (Winter) April - May (Spring). Head Clinicians make between $20-$30/hr depending on experience and qualifuications. Under the supervision of the Community Program Coordinator, Maverick Volleyball Head Clinicians deliver Maverick Volleyball Community Programs based on developed curriculums. 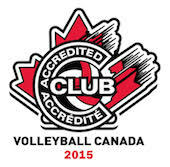 Experience in delivering youth volleyball programs and coaching volleyball. This is a part time position with a salary range of $20 to $30/hour. The hourly rate will be determined based on the experience of the selected candidate. We thank all candidates for their interest. Only those selected for an interview will be contacted. Le/la candidat(e) idéal(e) aura les compétences et les qualités suivantes: de l’expérience dans la prestation de programmes jeunesse de volleyball et entraîneur de volleyball. Priorité au client : la satisfaction de la clientèle (parents et participants) est une priorité et nos clients sont au centre de toutes nos décisions. On tient à offrir un excellent service aux clients internes et externes.